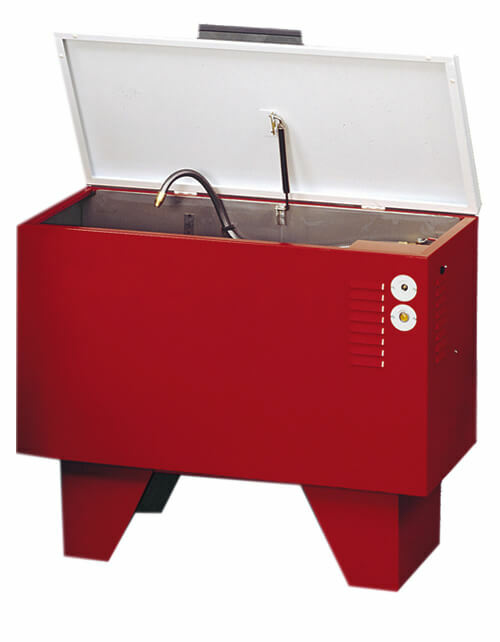 A solvent parts washer cleans grime and dirt of your parts with use of flushing power and parts washer solvents. 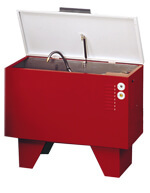 This is very different than other ultrasonic parts cleaner that employ mechanical sound to do most of the cleaning. 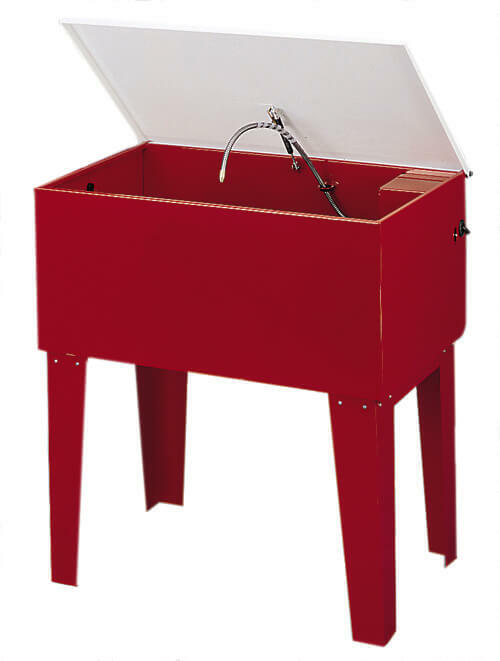 The units are ideal for small garages or large industrial environments. Larger units can clean multiple parts effectively and help save time. Smaller units use a manual cleaning method where the user can direct pressure as needed at their parts. Larger styles employ immersion cleaning to get off the worst baked on grime. While immersing the parts in the solvent, the user can walk away while the cleaning is done. 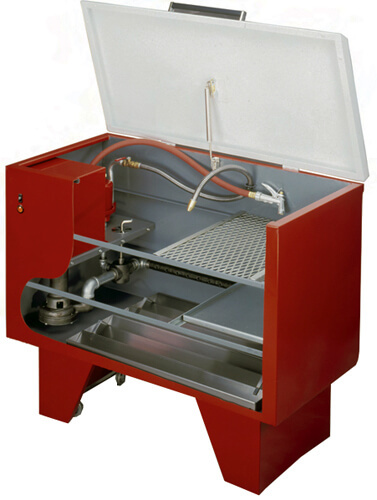 If you need to clean extremely large parts, consider the larger front load parts washers we can offer as well. Full size free standing unit offers professional features in an economical package. Ideal for general maintenance and repair in industrial, automotive, marine, or farm applications. 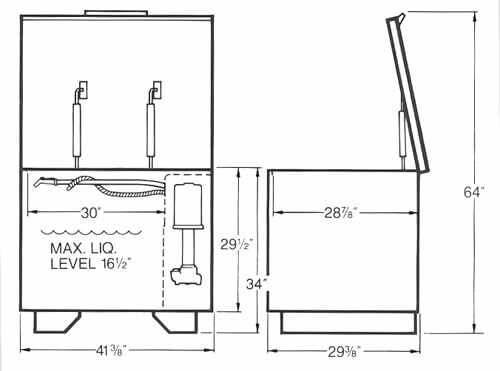 Overall Dimensions 18" x 36" x 54"
Drum Mount recirculating parts cleaners have spacious, open tanks designed two inches taller than the competition. They can be placed right at the job for on-the-spot cleaning tasks at a strain-free working height. 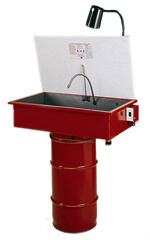 All units have abrasive-resistant, submersible pumps and two filters. Clean-up is fast and easy with minimal maintenance. Just remove the tank from the drum, clean both the strainer and reuseable nylon filter, remove the dirty fluid from the drum and refill. 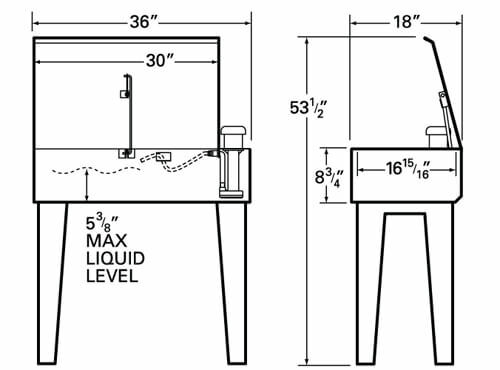 Built two inches taller than competition to eliminate bending/stooping - strain free use! 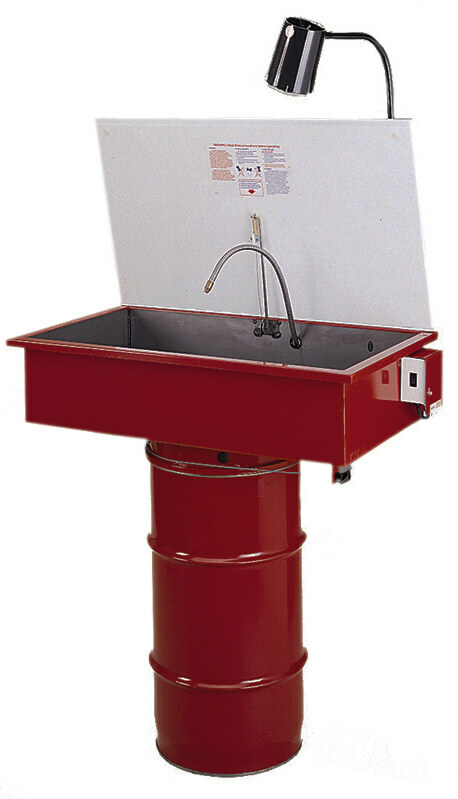 Has a patented retractable pump to avoid back strain when removing the tank from drum because the tank needs only to be lifted a few inches from drum. With pump inside mounting ring, tank sits flat on bench or floor, saving pump from abusive shocks or accidental mishandling. DMD/DMS232 32" 8-3/4" 28-1/2" 14-1/2" 18" 6-5/8"
DMD/DMS236 36" 8-3/4" 30-3/4" 19-1/4" 20" 6-1/8"
This 15 gallon tank model is ruggedly constructed. Parts are scrubbed by a hand-held brush under a flush hose. Parts rest on the shelf above fluid level or may be soaked in solvent below. 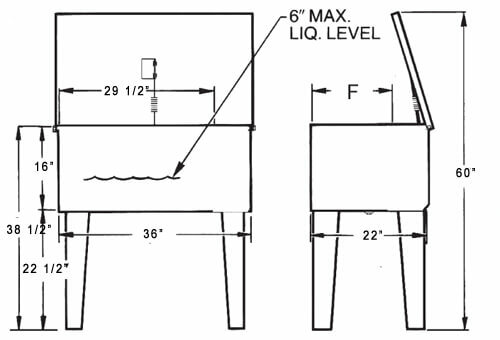 Cleaning fluid is circulated through a foam filter to trap finer particles that make it past the sludge collector. The sludge collector contains a dual element foam filter to help the larger volume of fluid remain free of contaminants for extended cleaning fluid life. Operating fluid capacity ranges from 8.5-15 gallons. 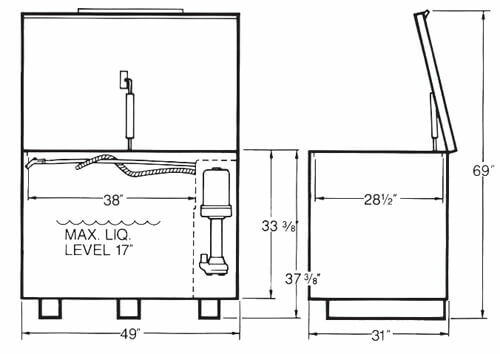 Fusible link safety cover, pump, removable sloped metal working shelf, small parts basket, sludge filter, bottom drain, and metal flush hose are standard with every unit. Operating fluid capacity ranges from 15-42 gallons. 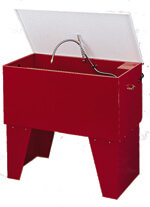 Metal grate keeps parts off tank bottom to expose all surfaces to agitating solvent. Or store both shelves in the side pocket to open the entire tank. Ruggedly constructed for years of trouble free solvent cleaning service. These feature packed models offer a variety of design elements to make your cleaning tasks quicker and more efficient while remaining flexible enough to suit most cleaning challenges. 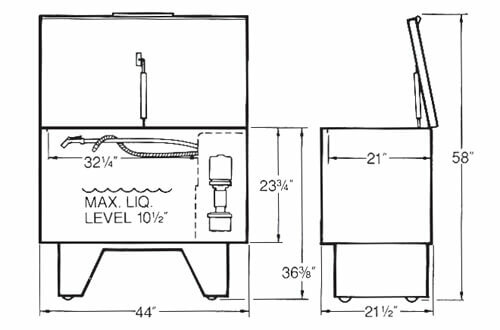 This line progresses in size from the 300-A with an 1/8 HP and 42 gallon capacity to the larger 902-A with two 1/3 HP pumps and 117 gallon capacity. Pistol grip flush nozzle with flexible neoprene hose. Adjustable for light spray or solid stream. Extra-long flexible metal faucet flow flush hose. 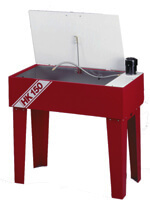 Washable 40 mesh screen filter, located above the liquid for easy service, filters solvent flow through both hoses. Large "On-Off" amber signal light. Two removable sludge trays for easier cleanup. Revolving casters (Models 300 and 500 only). Rugged heavy construction 14 and 16 gauge steel. The heart of the 300 system is a 1/10 HP centrifugal pump which delivers a 4.5 GPM flow through the flush hose.Designed with no bearings or seals immersed in the liquid, pumps are virtually abrasive-resistant. Pump discharge jet creates tank agitation to loosen dirt and grime as parts soak. 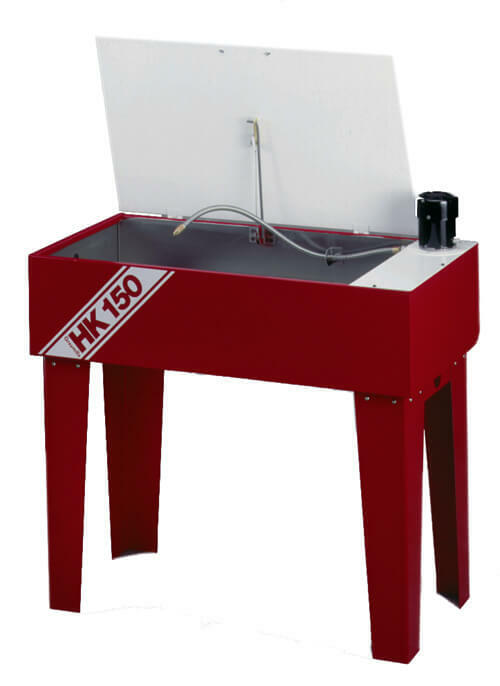 Model 500 features the same tank as the 300 with a more powerful 1/3 HP centrifugal pump and hydro-jet manifold. 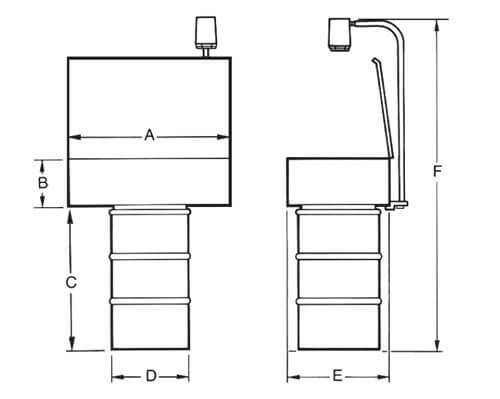 Pump flow capacity is 40 GPM through the manifold or 18 GPM through the flexible metal hose. The Model 800 offers all the operating features found on the 500 model - a powerful 1/3 HP centrifugal pump and hydro-jet manifold, with flow capacity of 40 GPM through the manifold or 18 GPM through the flexible metal hose - in a larger tank with twice the operating fluid capacity. These parts washer solvents tackle the toughest grease and grime. When you are looking for the ultimate in a pressure chemical sprayer, pressure washers accessories, extension wands, hoses or nozzles, there are vast product selections and brands at your disposal.